The name of this place translates from Jel as "Snake-Means-Death City," and it's known to be an ancient center of reverence for Sithis, the Dread Father whose other names are Chaos and Change. 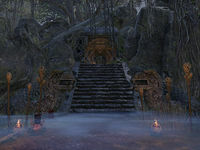 Xul-Thuxis is an abandoned Argonian settlement found in Murkmire. This page was last modified on 4 December 2018, at 15:15.